I frequently get asked about mental illnesses. Typically, the questions center around symptoms: what are symptoms of specific disorders, what types of behaviors indicate that something might be a problem, whether or not I think the questioner has a particular disorder. I’m very comfortable relating my experiences, but absolutely, positively not able to diagnose disorders or recommend treatment. I understand the desire to know more, though. 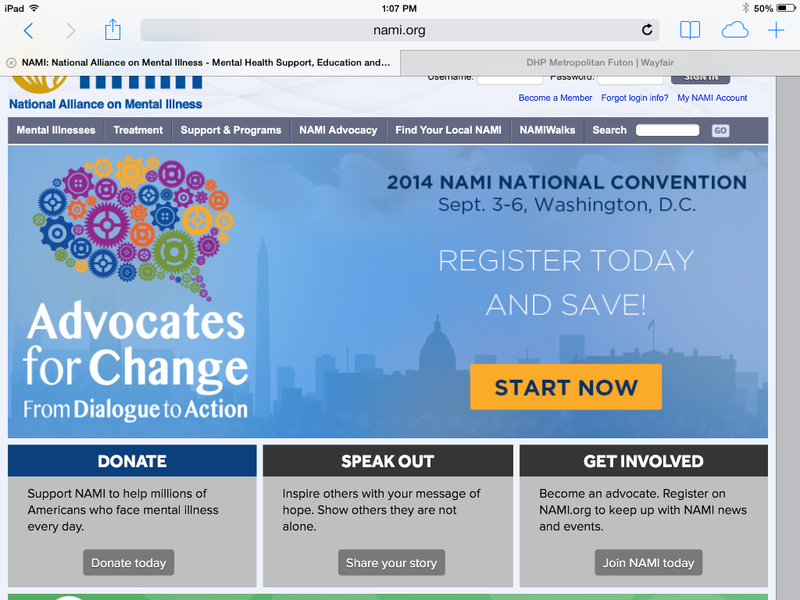 My go-to place for information on anything mental is nami.org, the website of the National Alliance on Mental Illness. NAMI is “the nation’s largest grassroots mental health organization dedicated to building better lives for the millions of Americans affected by mental illness.” NAMI is, in short, a huge organization that advocates, educates and supports the neurodiverse. because it’s easy to navigate. Finding what you’re looking for, from specifics about any neurodiversity to online support groups to schedules for NAMI Walks charity walks. Information on mental disorders is readily available by clicking on the “Mental Illness” tab. I’m not really fond of the “illness” label. It’s outdated—even the DSM V classifies everything as a disorder—and I’m not really sure why they still use it. Still, the list of conditions is extensive. I particularly like that the more common disorders are listed individually. Some websites place disorders within categories, so you have to know that OCD is an anxiety disorder. Not so NAMI. Anxiety, Eating disorders, OCD, Panic and PTSD each have their own listing. I recently looked up OCD and found comprehensive information. NAMI uses subheads so you don’t have to read through the whole thing to find what you might be looking for. You can also download a printable fact sheet though, depending on the disorder, the link may be at the top or the bottom of the page. Another nice feature under Mental Illnesses is a section for conditions related to mental illnesses, such as insomnia and suicide. These sections are comprehensive, too; the insomnia section covers causes as well as suggestions for self-help. I like that the psychopharmacological solutions are listed last. NAMI’s website also offers links to local chapters. I looked mine up and found that there are actually two chapters that serve my needs. My county chapter was really helpful and friendly. In fact, their education director, Erika Sokol, was one of the first contributors to Crazy Good Parent. I haven’t taken advantage of their support groups, but the bipolar groups meets on a convenient night. If I can get over my social phobia, I might check it out. I am not a doctor and I don’t play one on Crazy Good Parent. If you’re looking for information on just about any topic related to neurodiversity, NAMI is a crazy good resource.